It’s dropped passes, holding penalties, missed tackles and blown coverages every week. When I see these losses pile up, I think of the ESPN feature story about John Elway, which detailed Fox’s exit. Elway saw a lack of discipline -the same lack of discipline we’re seeing. And then, I get really concerned. The Bears lost on Sunday because the same players kept making the same mistakes and were never held accountable for them. 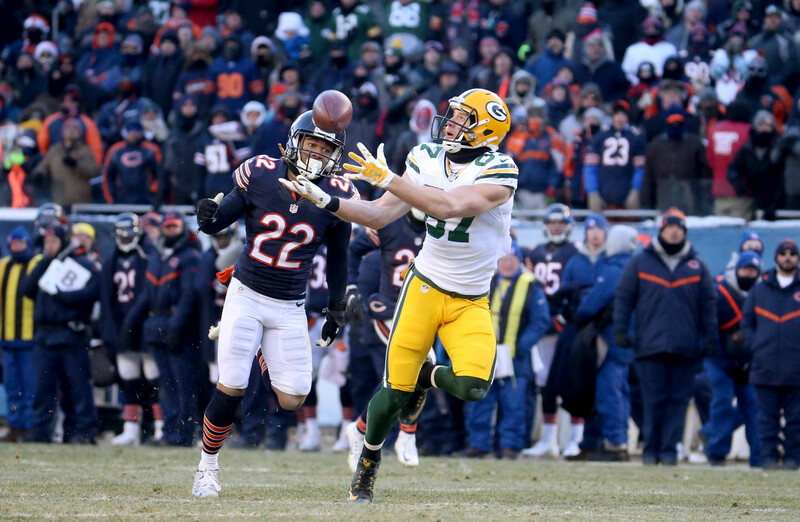 Cre’Von LeBlanc could not cover Jordy Nelson. That was proven over and over. Yet, with the game on the line, the Bears stuck with LeBlanc on Nelson and they were roasted. I’m all for developing players for the future, but LeBlanc isn’t going to be one of those players. Deiondre Hall might be so why not give him a shot? Furthermore, if we’ve already concluded that LeBlanc can’t cover Nelson, why would you leave him on an island on the game’s biggest play? It was a mind-numbingly stupid mistake by a coach who should know better. The Packers saw it and they salivated. Aaron Rodgers will always make John Fox’s teams pay for a lack of discipline. I don’t mean to beat a dead horse but I don’t think most fans really understand how bad LeBlanc was in this game. It isn’t just the 106 yards the Packers got off of him. They had four plays deep down the field that they simply didn’t connect on because the ball was dropped or the throw was off while the receiver was open. He’s the fourth cornerback on a team that doesn’t have three good cornerbacks. I’d be shocked if he was a significant part of the future and surprised if he made the team even next season. So, why were they so insistent on sticking with him? It doesn’t make any sense. Hall was a fourth round pick who has shown flashes of being solid. I don’t know if he’s the answer, but he at least has the size to match up with Nelson and Adams. Maybe Hall stinks, I have no idea, but I know LeBlanc stinks, what more do we need to see? The Bears spent much of the game using their best pass rusher as either a spy or in coverage. Leonard Floyd broke out recently because Vic Fangio had finally stopped using him as a back-seven player and started using him as a pass-rusher. For whatever reason, he didn’t do that this week. Floyd’s snap count percentage dropped to 80.3 percent from 86.1 percent against Detroit and 89.7 percent against San Francisco. It was still the most of any of their outside linebackers, by a wide margin, but when he was on the field, he wasn’t allowed to do what he does best. He’s a difference maker as a pass-rusher. He isn’t in coverage or as a spy. • The Bears missed 23 tackles. It’s just incredible. Nick Kwiatkoski missed seven on 61 snaps and there were at least three others that I easily could’ve counted because he flew in completely out of control. On a day like that, the Bears coaching staff needed to sit him for a few plays, give him some encouragement and get him back out there. Instead, they kept letting him make mistake after mistake. • Once again the Bears won the statistical battle in regards to which team could get more pressure on the quarterback, but that didn’t tell the entire story. The Packers only managed two hits and six disruptions on Matt Barkley, while the Bears recorded six hits on Rodgers and disrupted him 18 times. That large number, however, was largely due to the fact that Rodgers held onto the ball for a long time because his protection was so good. For their part, the Bears offensive line did an exceptional job though. • I charted seven inaccurate passes for Matt Barkley, but several were borderline as the ball placement was off, even though the passes were still catchable. He’s proving to be accurate and has continually shown the ability to make plays down the field. He’s not perfect by any stretch, but he’s an NFL quarterback. • Cameron Meredith is sneaky elusive. I had him down for three broken tackles in this game, second only to Jordan Howard. I have nightmares about Jordan Reed. OK, I wouldn’t call them nightmares, per say. More like night terrors. Who could forget last year when he caught all nine of the passes thrown his way for 120 yards and a touchdown? Or 2013 when he caught all nine passes thrown his way for 134 yards and a touchdown? They can’t seem to force even an incomplete pass when the ball goes in his direction. But Reed hurt his shoulder last week, then was ejected for punching a dude, who was wearing a helmet…yeah…not smart. As of now, I have no idea if he’ll play, but the Redskins played on Monday night and will head to Chicago for a this week’s game on Saturday. So, I think the Bears have a chance. The Redskins have a good offense, but I don’t trust Kirk Cousins. He aggressively tried to lose the game between the two teams last year, throwing into coverage multiple times, but the Bears couldn’t make a play. Maybe they still can’t, but they should be able to get more pressure to force more errors. Washington’s defense isn’t any good. They’ve given up at least 20 points and 350 yards in their last five games. The Bears should be able to score and they should be able to win. At least, until some stupid mistake happens late in the game, robbing them of yet another victory.